Yahtzee is a popular game that uses elements of poker with a set of five dice. Originally released by Milton-Bradley, the game is now owned by Hasbro. To win at Yahtzee you must score as many points as possible by rolling dice. 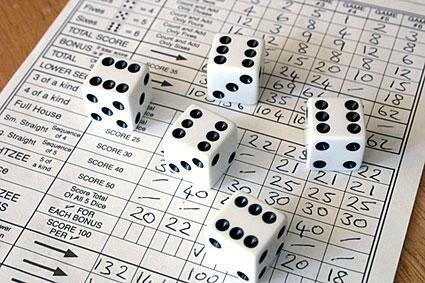 Scores are kept on a Yahtzee score sheet, and once a category has been filled out it cannot be used again. Unlike games like Monopoly, extensive equipment isn't needed to play. The main thing you need to play Yahtzee other than dice is a score sheet, making it common for avid players of the game to run out of this essential component. When you play Yahtzee there are various number combinations you need to roll in order to score. The scoring categories are divided into two sections -- the upper section and the lower section. The upper section consists of points scored by collecting dice of the same number and recording the total. For example, if you were to throw four dice that showed fives you would be able to record twenty points. A bonus of 35 points is awarded for players who score more than 63 points in the upper section of their score card. The lower section is made up of categories that are like hands in a poker game. Three of a kind, four of a kind and full house (three of a kind and a pair) are among the categories in the lower section. Three and four of a kind results in a score totaling the results from all five dice thrown. A full house nets a straight 25 points. A small straight consists of four dice thrown in sequence, such as a one, two, three and four, and scores 30 points. A large straight is made up of all five dice in sequence offers 40 points. "Yahtzee" is not just the name of the game, it is also a category in the lower section of the score sheet comprised of five of a kind and providing 50 points for the player lucky enough to get a Yahtzee. This is also the only category a player can use more than once, with subsequent Yahtzees resulting in 100 points each. The final category is titled "chance" and is the sum of all dice thrown, regardless of what they may be. Players often use this when they cannot come up with a good "hand" from their thrown dice. Yahtzee score sheets have one very economical benefit in that you can use them to play multiple games. A standard set of Yahtzee score cards can fit as many as six games on a single sheet. For the person looking to save paper as well as money this can be helpful. Make Your Own: This can be time consuming, but great if you are in a pinch and need a score card right away using blank paper, a pen or pencil, and a ruler. Those who spend a lot of time playing Yahtzee will have little trouble throwing together a score card on a piece of paper from memory. A spreadsheet program is another option for making your own, using your computer and printer. Download and Print Them Out: There are a number of websites on the Internet that provide you with Yahtzee score sheets in PDF format. The brilliant thing is that because they do not identically match the score cards produced by Hasbro, there is no copyright infringement. Buy Them: There is also the option of buying new score cards. Chances are the place that you purchased your Yahtzee set from will have an inventory of score cards for purchase. If not, you can buy sets of score cards from leading online retailers such as Amazon. Online auction house eBay often has scads of vintage Yahtzee score cards for those who would like to bring a retro flavor to the game. You can't play Yahtzee without a score sheet, but creating your own score cards can be quick and simple. Purchase, create, or print several score sheets at a time to keep a supply on hand, so you can enjoy one of America's most beloved games with friends and family.